Combine yogurt and vinegar in a large bowl; whisk until smooth. Stir diced apples in the dressing to coat (this will keep the apples from turning dark). 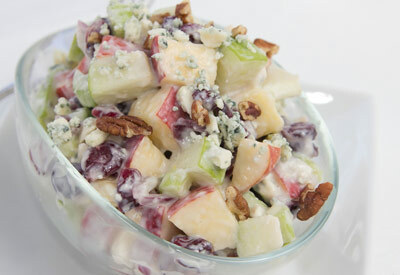 Stir in cranberries, celery, onion and Gorgonzola cheese; cover and chill. To serve, sprinkle toasted pecans over salad. *To toast pecans, bake uncovered in ungreased shallow pan in 350 degree F oven about 7 minutes, stirring occasionally, until golden brown. Or cook in ungreased heavy skillet over medium-low heat 5 to 7 minutes, stirring frequently until browning begins, then stirring constantly until golden brown.